In this Part, we will explore the meaning of the 16th Shloka of Sri Vishnu Sahasranamam. Bhagavan is an effulgent One who is the cause of the radiance in all objects like Sun, Moon and the stars. He is an object of enjoyment and He is also an enjoyer. He enjoys the humble offerings of His devotees that are given out of pure love and devotion. He is very forgiving and patient and withstands all attacks. He prevails over everyone with his noble qualities. He is Jyeshta or the eldest as He created the Universe and existed before everything else. He is untainted and sinless despite taking Avataars in this Samsara. He is victorious and He is the source of everything. He is Omnipresent as Antaratma in all objects of his Creation. ‘Bhraajate iti Bhraajishnuh tat sheelah – One whose nature is to shine’. Sri Adi Sankara’s says ‘Prakaashaika rasatvaat bhraajishnuh – He is the essence of brilliance’. Meaning: Not the Sun, not the Moon and the stars, not even the fire or lightning provide energy to the Brahman. That alone when it lights up, everything gets lit! Everything that shines, shines because of Him. The radiance in the Sun, the light in the Moon and Stars, arise only because of His effulgence. Every other object merely reflects his light. Sri Parasara Bhattar comments that it is Bhagavan’s nature to show Himself to His devotees. Shri Radhakrishna Shastri points out that we see objects because of the light which makes them visible, and we see the light only because it gets scattered by the objects. But Bhagavan is Pure Effulgence without any association with any object, and this is probably why the non-devotees don’t see Him, though He makes Himself visible to His devotees. Bhojanam literally means food or the means of sustenance. 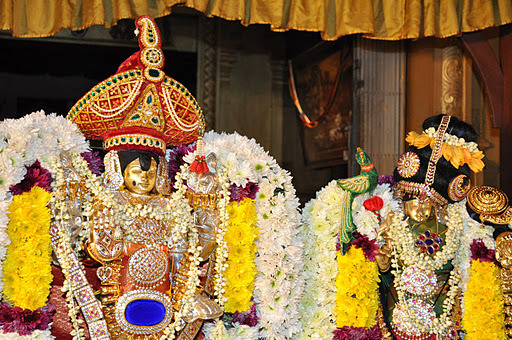 The Azhwars in their pasurams have described the Lord as Honey, Sugar cane, Jaggery, Nectar etc. In nature, even though one object becomes the means of sustenance of another object, HE is the one who maintains this balance and sustains everything. The Vedantic interpretation for Bhojanam is that it’s the collection of all objects of enjoyment by the sense-organs. HE makes the objects of this world fit for enjoyment, and HE also becomes the object of enjoyment Himself when His devotees overcome the desire for material objects of enjoyment and long for Him. According to Adi Sankara, Bhojanam is another name for Maya or the worldly illusion. Since Bhagavan is the originator of this force of Maya he is called Bhojanam. Meaning: This divine Maya of Mine, consisting of three modes of material nature (Sattva, Rajas and Tamas), is difficult to overcome. But those who have surrendered unto ME can easily cross beyond it. ‘Bhunkte iti bhoktaa means HE is the One who enjoys’. Like a mother enjoying the company of her children he enjoys the company of his creations. He enjoys the offerings of his devotees. He enjoys their Yagnas. He is the Bhoktaa for all the sacrificial offerings irrespective of the deity to which the offering is made. Meaning: If a devotee offers to me a mere leaf, flower, fruit, or water with sincere devotion and love, I accept it as an invaluable treasure.” Bhagavan enjoys the offerings by His devotees and values it like a treasure. Let’s look at a few stories now to appreciate this aspect of the Lord. ANDAL is also known as Soodi Kodutha Sudarkodi which means the bright creeper like woman who gave her garlands after wearing them. 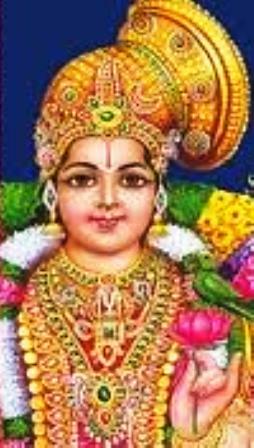 Andal was born in SriVilliputhur near Madurai, with the birth-star Pooram, and is the only female amongst the 12 Azhwars and an avatar of BhuDevi (mother Earth). Andal was a treasure-trove infant, found in the Tulasi garden, in the premises of the temple of Sri Vatapatra Sai. Vishnucitta, her father, more popularly known as Periyazhwar, found her while tending the garden and brought her up as his child and named her Kothai. Kothai grew up in holy surroundings, worshipping the Deity and listening to holy discourses, Vedas, Epics, Bhajans, Keerthans, etc. From her early childhood she listened to the Leelas (pranks) of Krishna with rapt attention and developed a deep love towards the Lord. Kothai helped her father in weaving the flower garlands to offer it to the temple Deity every day. One morning, Perialwar observed Kothai adorning herself with the flower-garland intended for the Deity and admiring herself in the mirror and enjoying the routine. He considered this as an act of sacrilege and, with great anguish, failed to offer the garland to the Deity that day. The Lord appeared in his dream and informed him that He only relished the garland worn by Kothai and that in future, only the flower garlands worn by Kothai be offered to Him. 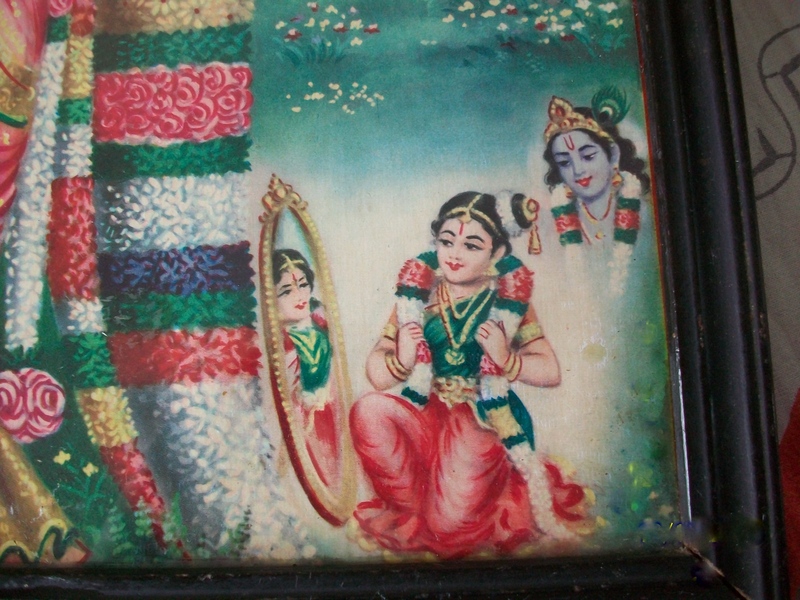 Perialwar realised the Divinity in Kothai and from thence she was reputed as “Andal” (one who ruled Bhagwan) and “Soodi Kodutha Nachiar” (patroness who would offer flowers after adorning herself). It became a routine for Andal to wear the flower garland prior to offering to the Deity. 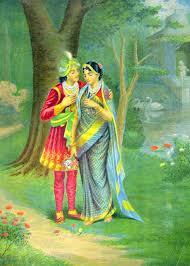 As Andal grew up, her love for Krishna also increased and she resolved to marry Him. When Andal attained adolescence, Vishnuchittar was amazed at her conviction to marry Krishna. She was advised to observe the Margazhi month rituals, which was a custom of yore for marriageable girls to get choice husbands. Andal imagined herself as a cow-girl from the time of Sri Krishna, assembling all girls at Ayarpadi at dawn during the month of Margazhi month, day after day performing the ritual on the banks of the river Yamuna and bathing the Deity. This procedure, expressed lucidly in the thirty Hymns, awakening her mates and proceeding to the river-bed, with Bhajan and Keerthan and to bathe the Deity, is the theme of Tiruppavai. Apart from Tiruppavai, Andal also composed 143 Hymns in Nachiar Tirumozhi in which her expression of intense love to Krishna, in varying moods of bridal love–tender hope, utter dejection, joyful triumph, woeful sorrow and total surrender–are depicted. Tiruppavai is still recited by devotees during the winter festival season in the month of Margazhi. Andal concluded that Lord Krishna was none other than the Deity of Sri Rangam–Lord Ranganatha– and chose Him as her Consort. 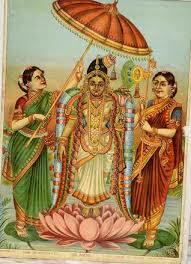 Lord Ranganatha bode Perialwar in a dream to bring Andal to Sri Rangam in bridal decoration. A palanquin, duly decorated, was sent from the Sri Rangam temple, as instructed by the Lord in a dream to the temple chief. King Vallaba Deva made elaborate arrangements, decorated the procession route and greeted Andal with music and other paraphernalia of a Divine wedding. People cheered the procession and King Vallaba also joined the bridal party. Andal proceeded inside the sanctum sanctorum of the temple and became one with the Lord, as she worshipped the Lotus Feet of Him. To the astonishment and wonder of the people assembled, Andal’s physical body merged with the Deity, Lord Ranganatha. Now let’s look at another Story. This one is about Kurumbu Arutha Nambi. King Thondaimaan was a benefactor of the Lord Venkateswara Temple in Tirupati and he used to offer flowers made in gold to the Lord regularly. At the same time there was a poor potter who was an ardent devotee of the Lord and would make flowers from clay and offer it to the Lord with total devotion. The Lord accepted the clay flowers and rejected the flowers of gold signifying his love for his true devotees. Shabari was a hunter’s daughter and belonged to the Nishadha tribal community. The night before her marriage, she saw that her father was buying hundreds of goats and sheep which were going to be sacrificed the following day for the marriage feast. Moved by compassion, in the early hours of the morning, she renounced the world and ran away to meet a spiritual Master. After days of travelling, she met Sage Matanga at the foot of the Mountain Rishyamukha and adopted him as her Guru, serving him with utmost devotion. When her Guru Matanga was about to attain Samadhi, Shabari, now an old woman after serving him throughout her life, expressed her desire that she now wanted to reach the same “abode of peace” as Sage Matanga. 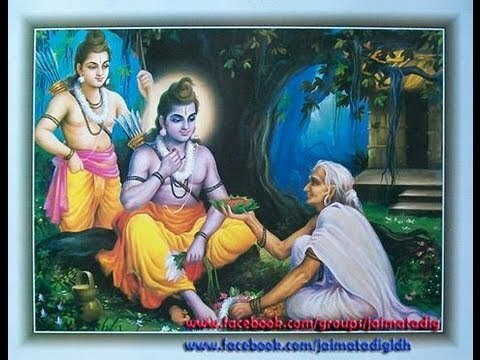 The Sage said that by virtue of her service, she will be blessed by Lord Rama who shall give her Darshan and he asked her to wait for his arrival. Saying thus, the sage sitting in lotus posture attained Mahasamadhi. As per her Guru’s advise, Shabari waited for the arrival of Lord Rama. Everyday Shabari would go out of her ashram, clear the path of thorns and pebbles so that the Lord’s feet will not get hurt. With the help of a walking stick she would go and pluck berries for Lord Rama. She would pluck a fruit, first taste it, and if it was sweet she would put it in her basket and discard the bitter ones. She wanted to give the sweetest fruits to Lord Rama. It never occurred to her that she should not be tasting the food intended for the Lord. Thus collecting a few fruits, Shabari would go back to her ashram and eagerly await Rama’s arrival. ‘Shabari’ is a commonly used metaphor for an endless wait for God. 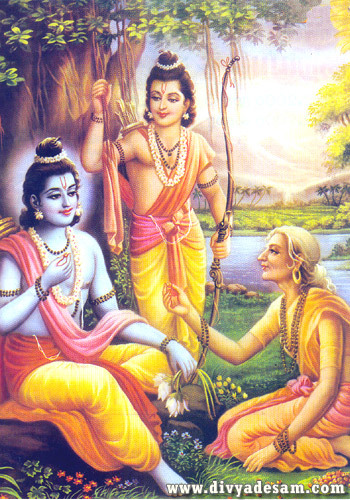 Even though hundreds of other Yogis were waiting to receive Rama in their ashrams, Rama went to Shabari’s ashram because of her sincere devotion. On seeing Rama, Shabari became ecstatic and said, “I do not have anything to offer other than my heart, but here are some berry fruits. I have tasted every berry to make sure they are sweetest of berries for you. May it please you, my Lord.” Saying so, Shabari offered the fruits she had meticulously collected to Rama. 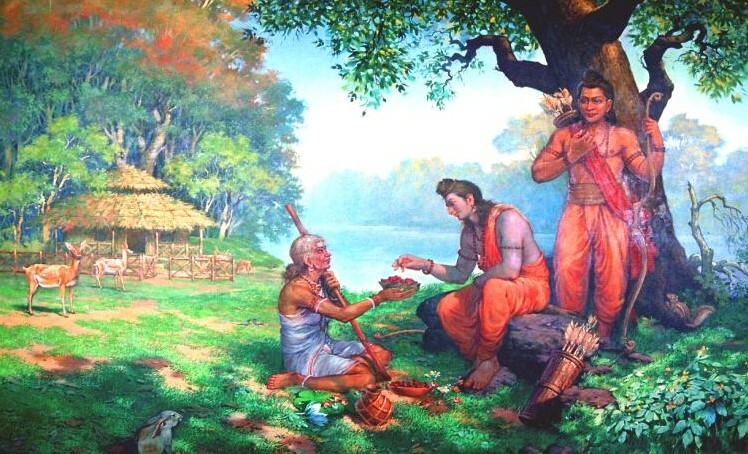 When Rama was tasting the berries, Lakshmana raised the concern that Shabari had already tasted them and therefore the berries were unworthy of eating. There were so many exalted Yogis waiting for Lord Rama’s Darshan, but He went to see the simpleton Shabari. This shows that Lord neither sees whether a devotee is rich or poor, live in a palace or a humble hut, erudite or ignorant, nor does he worry about their caste or colour. HE sees only pure ‘Bhakti’ or true devotion. 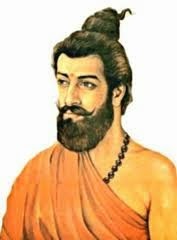 Periya Thirumalai Nambi, otherwise known as Srisailapoorna, was an ardent disciple of Yamunacharya. He was the maternal uncle of Swami Ramanujacharya and Govinda Bhattar. He was also their mentor in their poorvashrama. 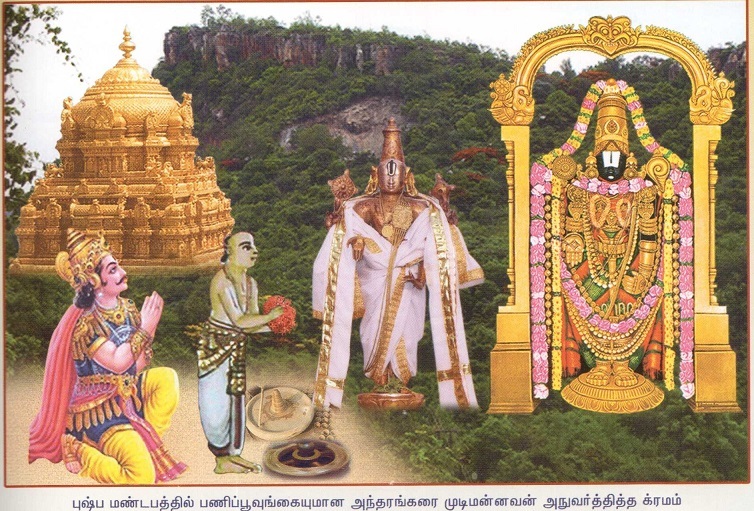 Srisailapoorna was one of the Pancha Acharyas (5 mentors) of Swamy Ramanuja charya, who was recognised as Jagad Acharya. In his last days, when Nambi was very old, he still was doing his daily duties or kainkaryam of carrying water to Thiru Venkatamudaiyan in Tirupati. One day a small boy came to Nambi and requested for water while Nambi was carrying water in a pot as usual for Thiruvaradhanam. Nambi refused saying that if he gives him water he has to go to Akasha Ganga to bring water afresh and that he didn’t have the strength to do the same. The boy told, “Thatha! I am very thirsty so please give me little water to quench my thirst.” Nambi refused and proceeded towards the temple. The boy took a small stone hit the pot at the back without Nambi realising the same and started to drink the water that poured out. As the weight decreased Nambi realised the situation and got very upset. Upon that instance, the boy showed his manifestation as Lord Venkateswara and gave Darshan to Nambi. He then instructed him to fetch water from the Koneri Pushkarini that is close to the temple. From that day Thirumalai nambi is celebrated as ThathAcharya. Sahishnuh also means one who is tolerant and forgiving the trespasses of everybody. The word Sahishnuh is derived from ‘sah’ which means to ‘put up with’ or ‘forgive’. The affix ‘ishnuh’ is added to indicate one’s nature or one having a specific habit. Thus, it is His Nature to forgive. The Yajur Veda mantra says “saho’si saho mayi dhehi”. ‘sah’ also means to suffer patiently. He is sahishNu because He suffers patiently, in His perfect detachment, of all that is happening around Him. He is just a mere witness. He continues to support this world without ever getting impatient – nAk Shasta pyate bhUri bhArah – from the Rig Veda. Sahate also means conquers, and Sri Adi Sankara interprets this naama to mean that Bhagavan is ‘sahishNu’ because He conquers daityas such as hiraNyAksha. Sahishnuh means one who can withstand any attacks on self. As Adi Sankara puts it ‘Hiranyaakshaadeen Sahate abhibhavati iti Sahishnuh – He is able to withstand attacks from Asuras like Hiranyaaksha and ultimately conquer them’. Kaliyan also known as Kalingan was a poisonous Naga living in the Yamuna River, in Vrindavan. Over the years, the water had turned totally poisonous, thereby causing trouble to fish, cattle, birds and all living things. Legend had it that Kaliyan had chosen that place as Garuda was prevented from entering there. 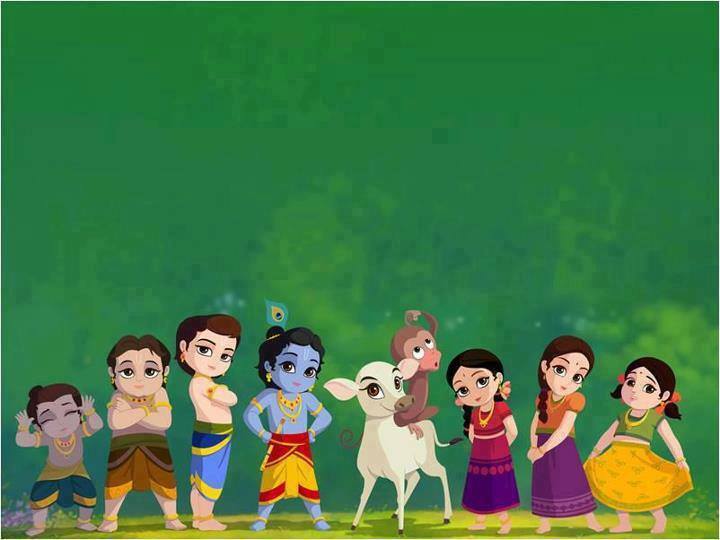 Lord Krishna was playing with his cowherd friends and the ball fell into the water. Krishna playfully jumped into it. Kāliyan seething with anger, rose up emitting poison and wrapped himself around Krishna’s body. The folks around were mortally afraid and started screaming and praying. Lord Krishna subdued him, sprang onto Kāliya’s head and danced on its head. The serpent king’s wife came and prayed to Lord Krishna with folded hands. Kāliyan, too, recognising the greatness of Krishna, surrendered, promising he would not harass anybody. Lord Krishna pardoned him and showed him the divine path, once he vowed to eschew violence and fell at His Lotus Feet. 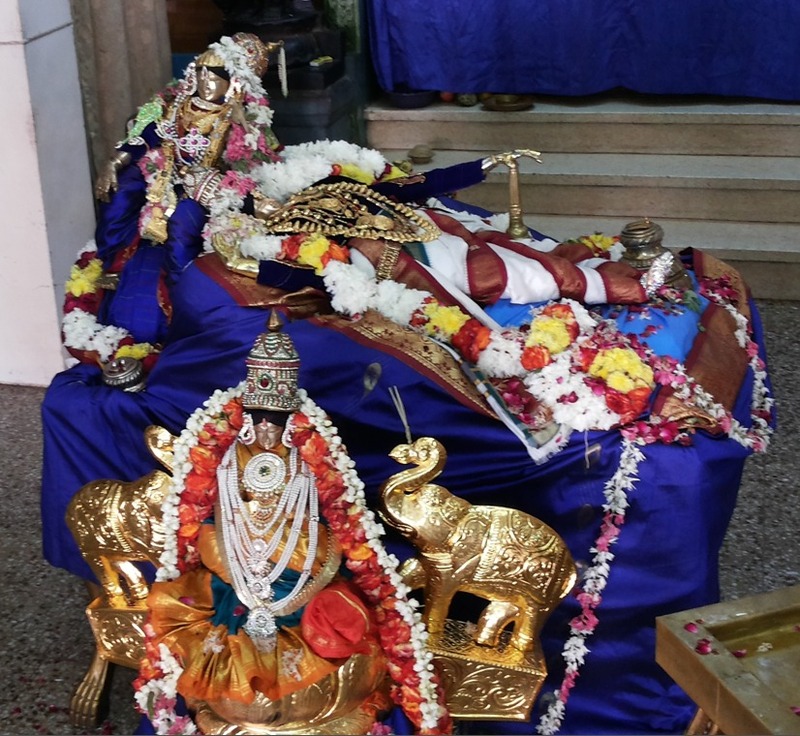 Kulasekhara Azhwar in his Perumal Thirumozhi lists out some of the deeds of Bala Krishna, from Devaki’s perspective as she missed out on Krishna’s childhood. His Pasuram includes references to Kalinga nardhanam amongst Krishna’s many leelas. Meaning : He held the Govardhana hill as an umbrella to protect the Gokula vasees, He danced with the Gopikas, he danced on pots turned upside down, he hurled the asura who came as a calf thereby knocking down the wood-apples from the tree, he danced on Kaliyan’s hood, – I have not seen any of these and the other victorious child plays of yours. If there is any way that I, this lowly self, can see them now, please tell and satisfy me. Meaning: This Pasuram is about the story of the most dreaded five hooded snake Kaliyan and the exploit of Lord Krishna who jumped into the river and danced on the hood of the deadly snake, thereby turning the lake turbid – and when Kaliyan surrendered, He benevolently forgave him. Thus Lord once again shows his Kaarunya bhaava. 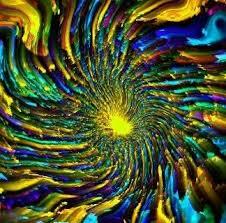 jagat + Adi + jAtah = jagadAdijah – It means somebody who manifested himself at the beginning of the Universe. 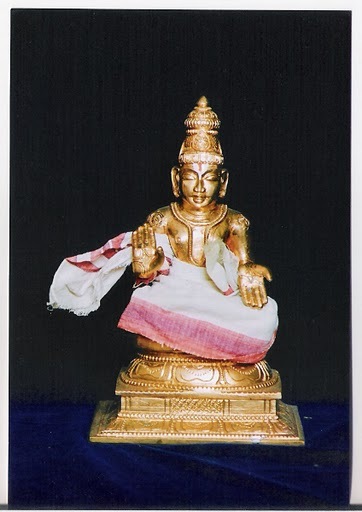 Adi Sankara interprets this as ‘Hiranyagarbha roopena Jagadaadou utpadyate svayam iti Jagadaaadijah – He appeared in the form of Hiranyagarbha (the golden primordial egg) at the beginning of the creation of the Universe’. Hiranyagarbha Sooktam says ‘Hiranyagarbhas Samavarta taagre Bhootasya Jatah Patireka Aaseet – Hiranyagarbha existed at the very beginning and He is the leader of all beings’. Before the world got created, one who had the ability to create the world had to exist. Thus Bhagavan existed before the world was created. SrI ChinmayAnanda points out that the manifestation of Bhagavan as Hiranyagarbha, is the form where all the world objects is submerged after pralaya into him before the gross world emerging out again. This is the manifestation of BhagavAn as the virAt Atma. ‘Aham Aadirhi Devaanaam Maharsheenaam Cha Sarvashah – I am earlier to all Devas and all great Sages’. 148. Anaghah – One who is sinless or Uncontaminated. Agham means sin so Anaghah is one who is pure and untouched by sin. In the words of Sri Adi Sankara ‘Agham na vidyate asya iti anaghah – One who carries no sin’. Chandogya Upanishad says ‘Apahata Paapma – the sinless one’. Though He resides in the midst of the Samsara in His incarnations, He is untainted by sins. Because He is unattached, He is not contaminated by the effects of any action. Several passages in the srutis’ refer to this attribute – Suddham apApaviddham – yajur 40.8, na puNya pApe mama (kaivalya 22),etc. Meaning – There is no karma that affects Me; nor do I aspire for the fruits of action’. In the Mahabharata when Abhimanyu’s son was still born and Uttara pleads to Krishna to save the child. ‘O Uttara, I never utter an untruth. My words will prove true. I shall revive this child in the presence of all creatures. Never before have I uttered an untruth even in jest. Never have I turned back from battle. By the merit of those acts let this child revive! As righteousness is dear to me, by the merit of that disposition of mine let Abhimanyu’s son, who is born dead, revive! Never hath a misunderstanding arisen between me and my friend Arjuna. Let this dead child revive by that truth! As truth and righteousness are always established in me, let this dead child of Abhimanyu revive by the merit of these! After these words were uttered by Vasudeva, the child became animate and began to move gradually and thus Krishna demonstrated that he is pure and untainted or Anagha. Vijayah means a winner. Sri Adi Sankara says ‘Vijayate Gnana Vairaagya Aishvarya Adibhihi Gunaihi Vishvam iti Vijayah – He wins over the world with his intellect, detachment, power and his noble qualities hence he is called Vijayah’. 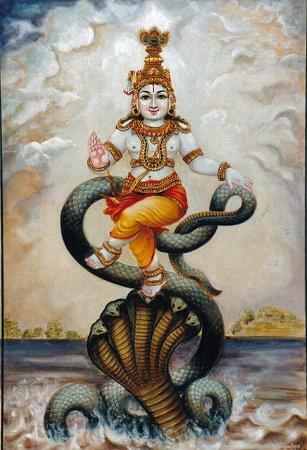 ‘Vividham viSesheNa vA jayati iti vijayah – One who wins over everything in different and special ways.’ He is Sat, Cit, and Ananda rupa, and thus controls everything including the prakriti and jivas. Or He excels in everything – ~jnAna, vairAgya, aisvarya, etc. Sri Parasara Bhattar points out that He is Vijayah because He controls everything that happens in this world, including the creation and destruction. “tadaadarshita panthaanau srishti samhaara kaarakau – Guided by Him in the right way, Brahma and Rudra carry out the task of creation and destruction (MahaBharatam moksha 169.19). Sarvam jagat sa jayati iti jetA – He is Jetaa because nothing can ever happen, that is not His will. One who has Satyam or Truth as His sthira guna or his Nature can never have any failure or defeat. Banasura, a mighty Asura once ruled over a large kingdom. So strong and fierce was his influence that all the kings and even some of the gods shuddered in front of his might. He was an ardent devotee of Lord Shiva, and he used his thousand arms to play the Mridanga when Lord Shiva was performing the tandava nrityam or dance. Shiva gave Banasura a boon and he requested Lord Shiva to be his protector. 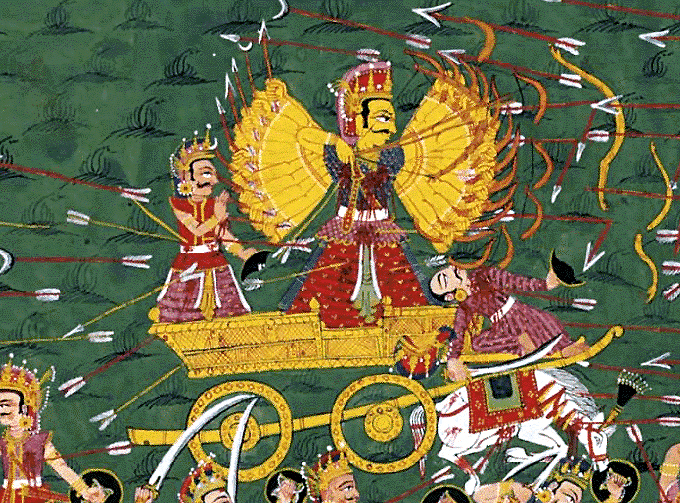 Banasura became invincible as a result of the boon. As time passed, Banasura become cruel and arrogant. 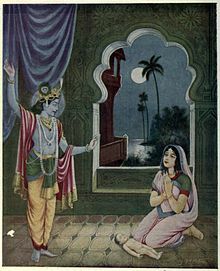 He locked up his daughter, Usha in a fortress called Agnigrah because many young suitors came to him asking for her hand. One day, Usha saw a young man in her dream and fell in love with him. Chitraleka was a friend of Usha and daughter of Kumbhanda, a Minister of Banasura. Chitralekha was a talented artist who helped Usha to identify the young man in her dream, by sketching various portraits. 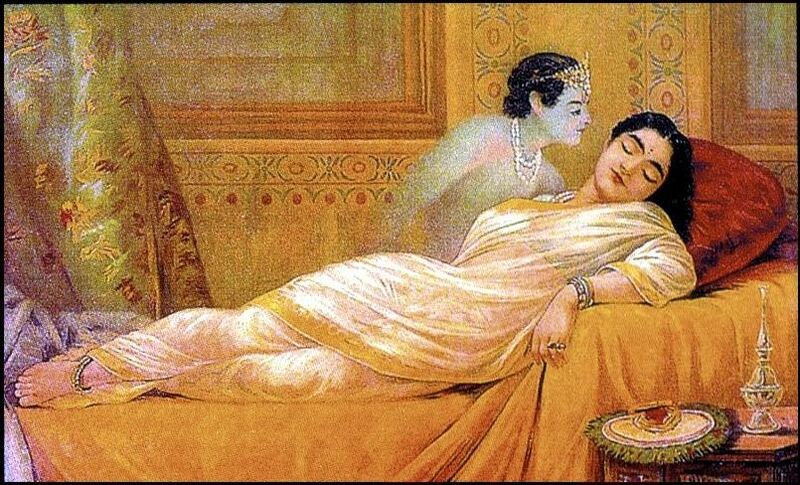 Usha had dreamt of Aniruddha, the grandson of Lord Krishna. Chitralekha, through her supernatural powers, abducted Aniruddha from the palace of Krishna and brought him to Usha. Anirudha and Usha were married in a temple but Aniruddha was held as a captive. 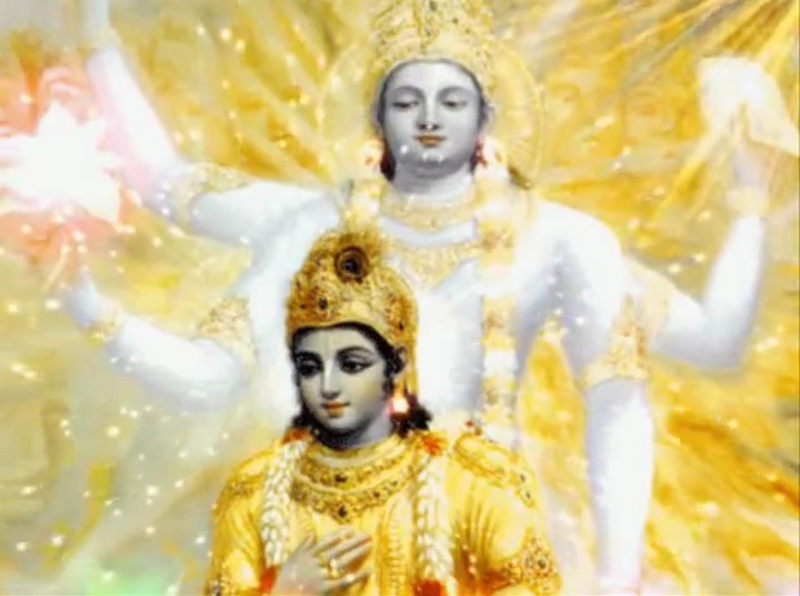 Lord Krishna came to the rescue of Aniruddha. 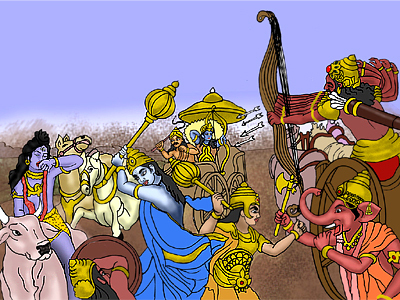 A great battle ensued between Banasura and Lord Krishna. Lord Shiva came to protect his devotee Banasura with his Ganas and sons, Ganesha and Kartikeya. Krishna invoked ‘jrmbhunastra’ and put Lord Shiva to sleep and prevailed over the rest. The story of Banasura ends with his defeat at the hands of Lord Krishna, who severed all the thousand arms of the demon sparing only two of them at the request of Lord Shiva who sought Lord Krishna to spare the life of the Asura as he had offered him protection. Banasura asked for the forgiveness of the Lord and he was allowed to live. Hence, Bhagavan is Jetaa as He conquers all. Vishvayonih can be interpreted in 3 different ways. The first is ‘Vishvasya Sakalasya Yonih Kaaranam Vishvayonih– He is the source of everything’. The second meaning is ‘Vishvam Yonih yasya sah Vishvayonih – He has the world as his cause’. This is because He has the world as the trigger for his birth, i.e., He manifests Himself in various incarnations depending on the condition of this world. The third interpretation is ‘Vishvascha asau Yonischa Vishvayonih – He is both the world and its cause’. The world and its cause cannot be separated from each other and both are nothing but aspects of Bhagavan. 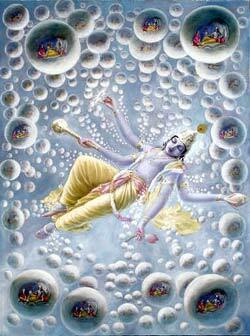 He is the AntarAtma of all the other gods whom He creates for different functions, beginning with Rudra and Brahma. In Moksha Dharma in Mahabharata we have Indra saying to Rudra – “tav AntarAtma mama ca ye caanye dehi-samjnitaah – He is the Inner Soul of yourself and myself as well as those who are called the Released Souls” – MB Moksha 179.4. Sankara says ‘Punah punah shareereshu vasati kshetrajna roopena iti Punarvasuh – He is called Punarvasuh because he lives in each living being as the Knower within or the Antaraatmaa’. It can also mean that He is Punarvasu because He recreates the world with the Sun, Moon, Stars etc., the same way all over again after each pralaya or deluge. Interestingly Punarvasuh is also one of the 27 stars and is the birth star of Shri Rama. Bhagavan is an effulgent One who is the cause of the radiance in all objects like Sun, Moon and the stars, hence He is Bhraajishnuh. He is an object of enjoyment and so He is Bhojanah. As He is also an enjoyer, He is Bhoktaa. He enjoys the humble offerings of HIS devotees that are given out of pure love and devotion. HE is very forgiving and patient. HE withstands all attacks and prevails over everyone with his noble qualities. hence He is known as Sahishnuh. He is Jyeshta or the eldest as HE created the Universe and existed before everything else and hence He is called Jagadaadijah. HE is untainted and sinless despite taking Avataars in this Samsara, so He is Anaghah. He is always victorious, hence He is Vijayah. He conquers all and hence knowns Jetaa. As He is the source of everything, He is Vishvayonih. He is omnipresent as Antaratma in all objects of his creation, hence He is Purnarvasuh. Thank you Uncle, I had forgotten the name Shabari as to who it was. I had a complete refresh of all the beautiful stories that you posted in this part. This is indeed an epic post. I loved this part the most because of such wonderful stories & of course Kuresan story is my favorite too. Hari Om Uncle! monster post with fabulous stories…bhojanam as maya was really something new.. couldnt find the story on Kurumbu Arutha Nambi though the title says so.. or am i missing something.. Thank you Karthik 🙂 There has been a popular demand for puranic stories. Since this is the 25th edition, I have added a few more stories than usual to mark the milestone! This is an epic post. The best ever Uncle. We loved all the stories you have mentioned here, Especially Shabari & Nambi. But the best one is still Kureshan’s story. The Andal stories are ever green though. We love the images too. Thank you Sridhar Uncle & Balaji Uncle. Navya Shri Ram & Me. Congratulations on this special silver edition. Meera just told me about the paraphernalia & the festivities here & its awesome to read from here too, we normally run a few shows of your youtube in our office big screen & the girls go wowing & whistling. I really like the way your stories unfold, keeps us glued & connected. Overwhelming! Mr.Sridhar “Tussi great ho”!!! Thanq guys (Mr.Sridhar & Mr.Shri Balaji) for this celestial & soul quenching illustration. Happy Dusshera to you & your families. Thank you Aishwarya….er…Nicole 🙂 Glad to hear that you (and team) are finding this informative and fulfilling your spiritual quest. Have a great Dussehra and May Lord Narayanaa bless your family! Hari Om! Congratulations on your 25th edition. 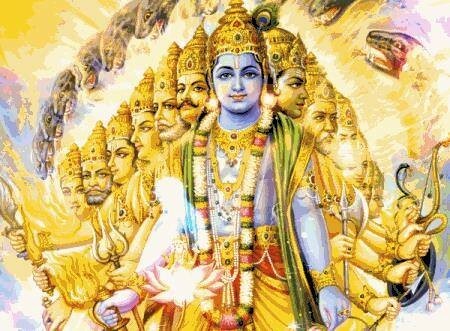 I am very happy & blessed to follow such an amazing & divine blog that is catering to almost all subjects right from Vishnu Sahasranama to management topics. Very fascinating commentaries, images & stories. I have been an ardent follower & have been sharing this site on my Facebook wall for the benifit of my friends too. Thank you Mr.Sridhar & Mr. Shri Balaji for your selfless efforts. Thank you Shammi for your kind words and support! May Lord Narayanaa bless you with happiness, peace, good health and prosperity! Hari Om! Thank you very much for your prompt reply Mr.Shri Balaji & Mr.Sridhar. Very polite & courteous of you. Have a great day! Amen! Hari Om! Congrats Mr.Sridhar & Mr.Shri Balaji for your 25th edition & this remarkable commentary. It is such a boost every week esp for working women like me to listen, view & read from this blog. It’s very rejuvenating! Thank you very much & may the Lord Narayana bless you with good health & prosperity. Thank you Nirmala for your kind words 🙂 May Lord Narayanaa shower his blessings on your family! Hari Om! Migamum arpudham!!!!!!!!!! I have no words to express like I commented on youtube. Thank you Mr. Sridhar & Mr. Shri Balaji for your efforts to present the world with such divine commentary, your stories & pugai padam are blissful. I want to thank my anonymous friend for introducing me to this divine blog. Thank you Meera for being a regular and for your encouraging comments:) May God bless you! Hari Om! Congrats on your grand 25th successful edition, Mr. Sridhar & Mr. Shri Balaji. This is indeed a celebration for our soul with such a feast spread out here. Spectacular & divine stories, looks like you strive a lot in your research & to know they are true stories from history is even more heartwarming. May the Lord always bless you with immense happiness, keep your faith strong, doesn’t matter who we believe in, my Son’. *Sorry to bother you, but I would like to know what the image on JagadAdijah depicts. Thnx! 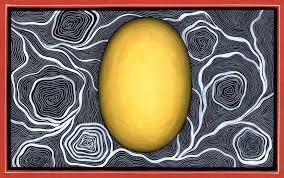 This picture represents the primordial golden egg (‘Hiranya Garbha’) from which the Universe emerged. You can say the egg exploded into the ‘Big Bang’ from which emanated the Universe. Many thanks for your kind wishes. I am very pleased to learn that you are relishing it. With respect to your question, as Shri Balaji has pointed out, it’s the primordial egg, a.k.a. Hiranyagarbha or the golden egg. Hiranyagarbha appears as the 71st Naama in the Vishnu Sahasranamam. Hope this clarifies. Hari Om! Amen!